Within a few years, machine learning will completely change the fashion industry. Fashion brands from small to big are already using machine learning techniques to predict and design what you’ll be wearing next year, next week, even tomorrow. 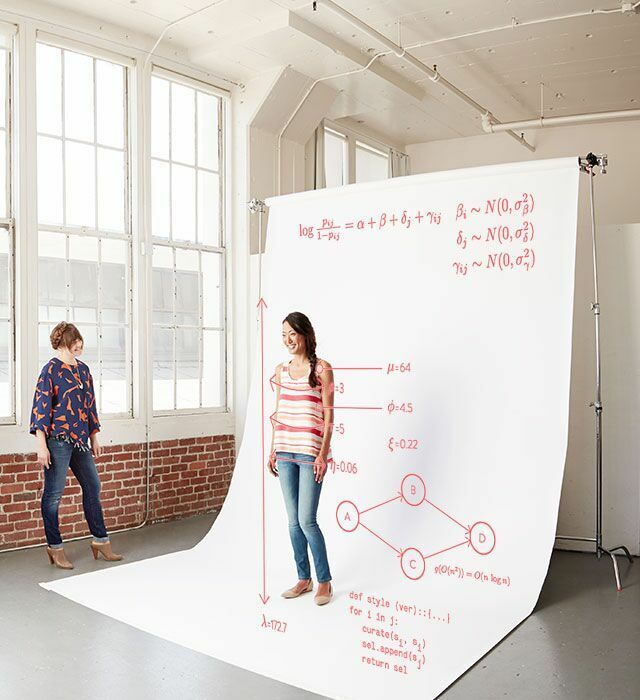 Stitch Fix is already at the forefront of AI-driven fashion with its hybrid design garments, which are created by algorithms that identify trends and styles missing from the Stitch Fix inventory and suggest new designs for human designers’ approval. Rent the Runway is another company that utilizes AI in the fashion realm. The company provides rentals of designer dresses to those who might otherwise not be able to afford them or may not need them long-term. They use extensive recommendation systems and machine learning algorithms to suggest dresses for their customers based on their profiles and optimize the delivery time. Pinterest has also done some amazing computer vision work in visual search, where fashion is a popular use case. The Pinterest Lens product allows users to discover ideas without having to find the right words to describe them first. For example, you can point the Lens at a pair of shoes, then tap to see related styles or even ideas for what else to wear them with. Within the larger artificial intelligence realm, computer vision is an important area of focus for fashion products, because a user’s buying decision is primarily influenced by the product’s visual appearance. Deep learning added a huge boost to this already rapidly developing field. With deep learning, a lot of new applications of computer vision techniques have been introduced and are now becoming parts of everyday lives (facial recognition, photo stylization, autonomous vehicles). In this post, we will build a model that is capable of doing large-scale visual recommendation. If you’re not familiar with that term, a visual recommendation model is one that can incorporate visual signals directly into the recommendation objective. Essentially, a user interested in buying a particular item from the screen may want to explore visually similar items before finishing her purchase. These could be items with similar colors, patterns, and shapes. More specifically, we will design a model that takes a fashion image as input (the image on the left below), and outputs a few most similar pictures of clothes in a given dataset of fashion images (the images on the right side). The architecture is based on the “Identity Mapping in Deep Residual Networks” paper by Kaiming He, Xiangyu Zhang, Shaoqing Ren, Jian Sun. The code is written in Python and uses TensorFlow, a popular deep learning framework. If you’re new to deep learning, computer vision and TensorFlow, I’d recommend getting a feel for them by checking out these tutorials I have written elsewhere   . In this project, I work with the DeepFashion dataset, which is collected by researchers in the Chinese Hong Kong University. It has over 800,000 diverse fashion images and rich annotations with additional information about landmarks, categories, pairs etc. The dataset consists of 5 different kinds of predicting subsets that are tailored towards their specific tasks. One subset, called Attribute Prediction, can be used for clothing category and attribute prediction. With close to 290,000 images of 50 clothing categories and 1,000 clothing attributes, this subset is ideal for our experiment. We will only use the upper body clothes images due to the limitation of computation resources and time. We changed the old labels of 6 categories and randomly picked 3,000 images from each category to have evenly distributed labels, as shown in the table below. After this step, we have 18,000 images in total. A random 1,500 of them are used as validation set and the others are used as train set. Deep neural networks are perfect tools to map an image to a vector that ignores the irrelevant details. We will train such neural networks to classify the clothing images into 6 categorical labels and use the feature layer as the deep features of the images. The feature layer will be able to capture features of the clothes, like the categories, fabrics, and patterns. We do that by searching for nearest neighbors based on the feature layer. To classify the images, we use a model based on deep residual networks (ResNet). ResNet is characterized by the residual block structure. This incorporates identity shortcut connections which essentially skip the training of one or more layers. The residual block is further optimized by a pre-activation module. This allows the gradients to propagate through the shortcut connections to any of the earlier layers without hindrance. Instead of starting with a convolution (weight), we start with a series of (BN=> RELU => CONV) * N layers (assuming bottleneck is being used). Then, the residual module outputs the addition operation that’s fed into the next residual module in the network (since residual modules are stacked on top of each other). (a) original bottleneck residual module. (e) full pre-activation residual module. Called pre-activation because BN and ReLU layers occur before the convolutions. The overall network architecture looked like below, and our model will be similar to it. We represent each image with the values of the feature layer (the global pool layer), as this layer captures the most detailed information of the images. Let’s look at the implementation of the ResNet architecture in TensorFlow. The create_variables function takes in name (the name of the variable), shape (a list of dimensions), initializer (Xavier is the default option), and is_fc_layer (set to be False). It returns the created variable new_variables. The output_layer function takes in input_layer (a 2D tensor) and num_labels (the number of output labels). It returns the output layers fc_h and fc_h2. The conv_bn_relu_layer function applies convolution, batch normalization and ReLU to the input tensor sequentially. It takes in input_layer (a 4D tensor), filter_shape (a list that contains [filter_height, filter_width, filter_depth, filter_number]), and stride (the stride size for our convolution). It returns a 4D tensor output. The bn_relu_conv_layer function applies batch normalization, ReLU and convolution to the input layer sequentially. The inputs and output are similar to that of conv_bn_relu_layer. The residual_block_new function defines a residual block in ResNet. It takes in input_layer (a 4D tensor), output_channel (the shape of our output tensor), and first_block (whether or not this is the first residual block of our network). It returns a 4D tensor output. The main inference function defines ResNet. It takes in input_tensor_batch (a 4D tensor), n (the number of residual blocks), reuse (setting it to be True if we want to build a train graph, False if we want to build a validation graph and share weights with a train graph). It returns the last layer in the network. We need to pre-process our images before they are suitable for training. Here are the hyper-parameters that are arbitrarily set. The code below reads in the path to the images and resizes them to 64 x 64 dimension. The code below loads the data NumPy arrays and whitens them with global average pixel ([103.939, 116.799, 123.68]) and the global standard deviation (68.76). We also augment the data by randomly flipping the images horizontally. We write a prepare_df function, which takes the path of a csv file and its column as inputs, and then returns a Pandas dataframe as output. We also write a loss function, which takes in labels, logits, bounding boxes and their labels as inputs, and returns a sum loss of cross entropy loss and mean squared error loss. We also need a top_k_error function, which takes the predictions, labels, and arbitrary k value as inputs, and returns the top k error value. Lastly, we also write a couple of operations function to be applied to the training and validation dataset. Let’s move on to the actual training step. All of the code below will be included in a train function. First, we apply the prepare_df function into our train and validation data. Then, we define a couple of important hyper-parameters to be used during training with TensorFlow. Below are the number of training samples, global step and validation step (which refer to the number of batches used during training). logits and vali_logits are the output of ResNet before going through the softmax function. bbox and vali_bbox are the bounding boxes of the images. These variables to perform inference on the test data. My loss function combines the regularization loss and the multi-label classification loss. Here are the variables for output predictions and top-1 error results. Here are the variables for training and validation operations. The empty lists below are initialized to keep track of the training steps, training errors, and validation errors. min_error is an arbitrary variable to maintain the current minimum error value. offset is used to limit the batch size. train_batch_df is the NumPy data array that contains training data batch. The function load_data_numpy is called on train_batch_df to return the 3 NumPy arrays of training batch, training batch labels, and training batch bounding boxes. The function generate_validation_batch is called on validation data to return the 3 NumPy arrays of validation batch, validation batch labels, and validation batch bounding boxes. The code below calculates the top 1 error value and loss value for validation data. The code below calculates the top 1 error value for training data. Strings of every iteration and corresponding loss values are also returned. The code below updates the current lowest error via the min_error variable. It also updates the step_list, train_error_list, and vali_error_list. The learning rate was 0.1 at the beginning and decayed to 0.01 at 25000 steps. The model was trained for 30000 steps in total. When training is finished, the model is saved into model.ckpt and the error_df data frame is saved into a separate csv file. All the images are then evaluated/tested using the well-trained model. The nearest neighbor search is based on the values of the feature layer. The recommendations to three example query images are shown below. We can see that the model can capture the style (including the sleeve length, the collar shape, and the slim/regular fit characteristics), the fabrics, and the printed pattern of the clothes. In the first example, the model captures deep features include the dress category, the chiffon fabrics, and the repeated floral pattern. The second example shows that the model can capture the dark color and the open zipper besides correctly classifying the query image into the jacket category. The third example shows that the model captures the soft fabric, the bright color and the blouse shirt category of the query image. Fashion domain is an ideal space to apply deep learning. It’s easy to find a ton of public data and the current deep learning algorithms are capable of almost any computer vision tasks. Different clothes have different attributes. For example, your shoes can be available in different colors and sizes, your shirts can be available different textures and patterns, and your pants can be available in different materials and width. A good understanding of such clothing attributes is extremely useful to do any sort of comparison between clothing products. Artificial intelligence can not only learn a piece of clothing’s attributes, but also can create computer-generated images of similar-looking items. This is quite valuable, especially for retailers, to create personalized clothes or even predict broader fashion trends. Unfortunately, generating realistic-looking fashion images has been a challenging task due to their high-dimensions. In order to cope with that, researchers again look towards deep learning techniques. In particular, recent approaches in image generation have made heavy use of generative adversarial networks, a popular unsupervised machine learning model where there are two neural networks fighting against each other. Clothing retrieval is essentially a subset of image retrieval, an ongoing active research in computer vision domain. This technique attempts to identify the topic of an image, find the right keywords to index the image, and define the appropriate words to retrieve that image. There is a semantic gap in between these objectives, making the meaning of an image to be highly individual and subjective. With the large amount of image data, image retrieval on a big dataset becomes an even more challenging visual task. James is currently studying at RIT for a Master’s degree to further his education in computer science and artificial intelligence. He has had professional experience in data science, product management, and technical writing. He is also an AI Writer for FloydHub. You can follow along with James on Twitter and Medium. Learn how to control a robotic arm using deep reinforcement learning techniques.